NCT Magazine is proud to introduce a new series in 2019, in partnership with Hotzone Solutions Group. 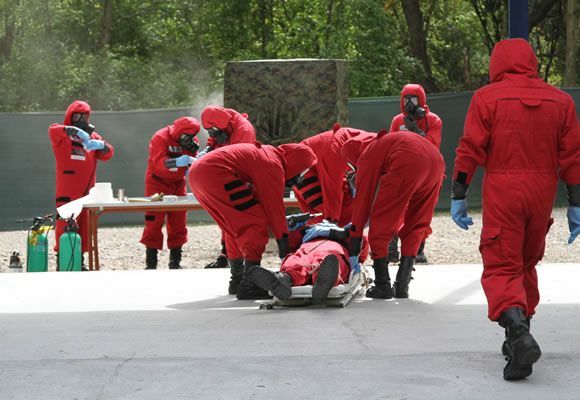 Hotzone Solutions is a group, based in The Hague, Netherlands, focused on providing realistic and practical chemical, biological and radiological / nuclear training to the military, law enforcement, emergency response and security communities. This series will be included in each issue and intends to provide valuable insight within the CBRNe industry by evaluating the latest developments and various products present within CBRN. clean or contaminated can be identified. In addition, the information acquired by these systems provides advice to military commanders and first responders regarding the choice Personal Protective Equipment (IPE), sampling procedures and testing procedures as well as medical countermeasures, if applicable. An ideal detector can be described as a detector capable of detecting both CWA and toxic industrial products. (ICT) selectively within an acceptable timeframe; Sensitive enough to detect the agent at concentrations lower than or equal to levels that pose a health risk and not be affected by other factors in the environment. The detector should have a fast reaction and a recovery time while being portable, easy to use and produce easy to interpret data. Not yet, the "ideal" detector is not a commercial reality. Many of the commercially available CWA detectors use technologies adapted from conventional analytical chemistry techniques. These technologies each have their advantages and disadvantages, which are discussed in detail here, and include mass spectroscopy, flame photometry, infrared spectroscopy, raman spectroscopy, colorimetry, photo-ionization and ionization mobile spectrometry, surface acoustic wave. For example, detection technologies have not yet been developed to allow the detection of the lowest concentrations according to certain criteria. The focus of most international research and development is now in the field of agent detection and identification and in the field of command and control systems. However, it is necessary to improve and extend the use of sensors to counter terrorism and minimizing the impact on a civilian population in the event of an incident. Beyond point sampling devices, it is critical to develop sensors that help provide sensitive and rapid detection and advanced warning of toxic vapors at sites such as buildings, railway stations and other airports. There are several factors to consider when choosing detection equipment. The detectors must operate in demanding and real environments where costs, portability and time are important factors. They must also be operational 24 hours a day, widely deployable and able to be networked. Another imperative is that the detectors are capable of detecting chemical agents with specificity and not be affected by co-existing substances in the atmosphere or by humidity or ambient temperature. At present, the most difficult aspect for the detection and identification of the chemical agent is the differentiation of the agent to measure other chemicals already present in the environment. In addition, detection sensitivity is a necessary factor for detectors to provide an advanced warning, and to be able to detect concentrations below IDLH levels. Ideally, when selecting a detector, a number of factors of detection capability and detection performance should be considered. The detection capability involves factors such as selectivity, sensitivity, response time and false alarm rates while detector performance includes factors such as warm-up time, calibration requirements, portability, power. The detector alarm threshold must be able to give protective equipment workers sufficient time before they become victims. The ability of detectors to resist is also important false alarms. Many field CA detection systems suffer from excessive false alarms when exposed to common substances, and their utility is greatly diminished. Similarly, if not more important, is the ability of an appliance to function properly with the presence of interfering vapors. It is also necessary to consider the ongoing needs and costs associated with training and maintenance. affected by other factors in the environment that cause false alarms. The detector should also have a fast response and recovery time, ie it should trigger an alarm agent in seconds and quickly be ready for further measurement In addition, it should be portable, easy to use and any data should be easily interpreted. Until now, no "ideal" detector exists on the market. Read further for desirable criteria of CBRN detection equipment. Selectivity is the ability of a detector to respond only to the targeted chemicals in a sample. A selective detector must be capable of separating targeted compounds, over a wide range of concentrations, from any other substance that may be present in a sample. Many chemical agent detectors are agent-specific, or must be configured in advance to find a particular agent. Therefore, depending on the technology used, the detectors vary in selectivity for certain compounds. However, the main disadvantage associated with selective detectors is that they are limited in the number of compounds they can detect. Currently, there is no single detector, absolutely selective or non-selective. For example, a CWA detector based on AP2 / 4C photometric flame detection (FPD) will only respond to phosphorus and sulfur compounds. Therefore, no detection for chemical agents having none of these elements. A selective chemical agent detector can, however, respond to chemicals that have properties similar to that measure, thus producing a positive false response. A less selective detector, on the other hand, will respond to a greater number of chemicals without discrimination and its responses can not be immediately attributed to chemical agents or nontoxic substances. For field applications, non-selective detectors may be more appropriate if a broad warning spectrum is desired or the environment is clean, ie it has not been exposed to chemical agent of war. 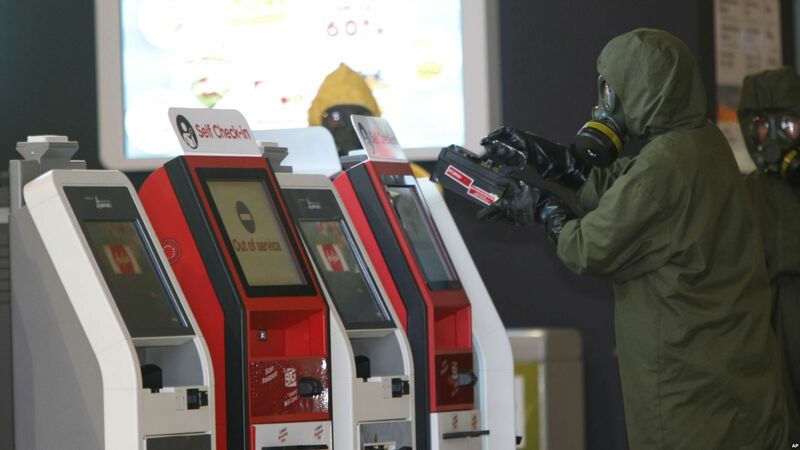 Non-selective detectors can be used to perform an initial survey of doubt of a zone in a civilian scenario, since these detectors can simultaneously respond to various chemicals and the chemicals used by unhealthy actors are generally unpredictable. However, if a nonselective detector produces a response, it would be necessary to monitor the suspect area with more specific detectors to identify or distinguish potential chemical agents from other compounds. The sensitivity is determined by the lowest concentration of a chemical agent that can be detected with confidence. It can also be called the limit of detection. Sensitivity can also be a measure of the ability of a detector to distinguish between different concentration of agent. In general, the more toxic a chemical is, the more sensitive the detector must be. The sensitivity of a detector may depend on a number of factors, including the agent and the environmental and operational conditions. An appropriate detector should have a low detection limit and then provide a warning well before the IDLH level is reached to allow proper evacuation of personnel. However, conventional CWA concentrations do not vary significantly between their IDLH and LD50 levels, so it is imperative that any detector used be sensitive enough to measure agent concentrations in small amounts or, at a minimum, at non-hazardous concentrations. At present, the sensitivity and specificity of many existing detectors need to be significantly improved. The response time is the time required for a detector to collect and analyze a sample, to determine if an agent is present. In other words, it is the time required for the detector to respond to selected chemicals. A desirable response time for a detector is in the order of a minute or less, but because of the rapid action of many chemical agents (neurotoxic agent), it is extremely important that a detector be able to Respond as quickly as possible in real time to minimize exposure and guide medical intervention. False alarms occur if a detector responds when an agent is not present, it is a false positive, or fails to respond to an agent present, it is a false negative. In general, the alarm levels for a detector are deliberately low to ensure a minimum number of false negatives. Positive false alarms are generally observed when the targeted compound is in the presence of interfering, which may be a chemical similar to the detecting agent or a substance that may contain elements that are also present in the chemical agent to be detected. For example, pesticides containing sulphide or phosphorus generate a false positive alarm when a FPD-based detector is used (AP2 / 4 C). 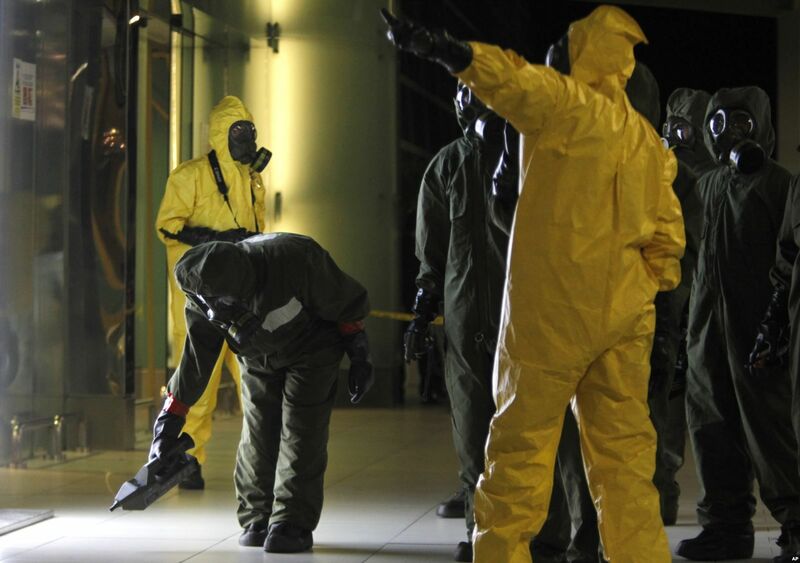 The occurrence of false positives in a civilian environment can have serious implications. For example, the presence of HD is masked when using an IMS system when the ambient humidity is too high. Or the false positive produced when using this technique next to a road vehicle, generating a response of the device in H mode produced by the exhaust gas of the vehicle. Or, a false alarm due to the use of some decontamination agent (typically RSDL which gives a false neurotoxic agent response with CAM), which can cause problems during the decontamination check. Most importantly, the repetition of positive alarms could lead to ignorance of future "real" alarms. At present, detectors are prone to give false positive alarms because most detect several compounds without being completely selective for a specific CA or class of agents. To overcome this problem another detector, based on a different technology, can be used to confirm any alarm. In reality . the use of two different simultaneous techniques (flame spectrometry and ims) makes it possible in many cases to reduce these disadvantages. False negative alarms are more problematic than positive false alarms producing an alarm can lead to dangerous situations. Failure of a detector to alert when an agent is present may be due to a number of reasons, including operator error, changing environmental conditions, effects of moisture, malfunctions of detector such as software problems, and the presence of chemical interferents that can mask normal detection capabilities. It is therefore imperative that the likely impact of false responses and the ability of detectors to resist interferences must be thoroughly explored prior to deployment in the field. One of the most important parameters when considering the performance of a detector is its ability to operate under a variety of environmental conditions. Ideally, a detector should be able to maintain its functions regardless of the environmental conditions. At present, commercially available detectors vary in a number of areas, including startup time, calibration requirements, portability, energy requirements, and ongoing costs associated with training and maintenance. As a result, choosing the right detector for an operation can be quite difficult. Other concerns include the costs associated with the operation, the time necessary to remove any residual chemical from the previous sample, (IMS problematic) waste generation, storage, maintenance frequency, ease of decontamination, if data can be saved for later analysis and whether the detector can be networked with other systems or remotely controlled. In addition, a detector capable of detecting neurotoxic agents may not be very useful to detect certain TICs. Therefore, to choose a suitable detector, knowing that the target chemicals are also very important factors to consider, as this will help to determine the techniques that are best suited to their use.